Many products can get window glass clean. PURETi Clean & Fresh not only cleans your window, but uses the power of light to keep the window cleaner longer and reduce odors and harmful VOCs in the air. 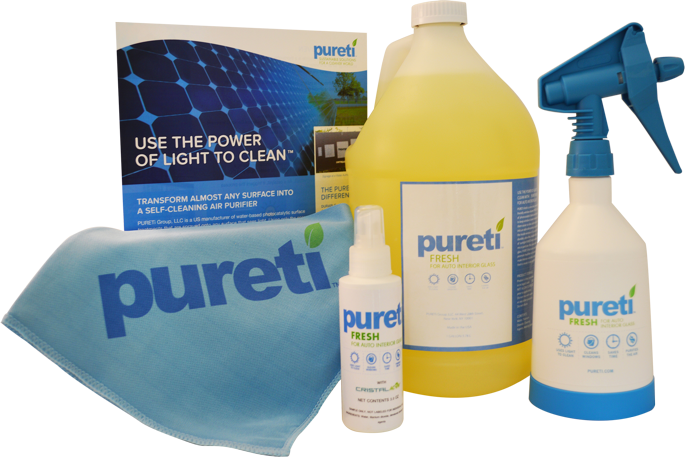 PURETi Clean & Fresh is a non-toxic, environmentally friendly glass cleaner that also cleans the air. PURETi Clean & Fresh’s active ingredient uses the energy from natural sunlight to safely break down organic grime, odors, and pollutants. In the presence of light, the glass surface keeps itself cleaner, resists fogging, and improves the air quality inside the cabin. One application reduces pet odors, smoke odors, food odors, and harmful VOCs for months.